The Noitom Hi5 VR Glove is designed for capturing full hand and finger action in virtual reality. You can now have both hands in the experience thanks to our IMU sensor technology. Hi5 VR Glove delivers lightning fast response, pinpoint accuracy and plug-and-play convenience for transporting hands into the virtual environment. 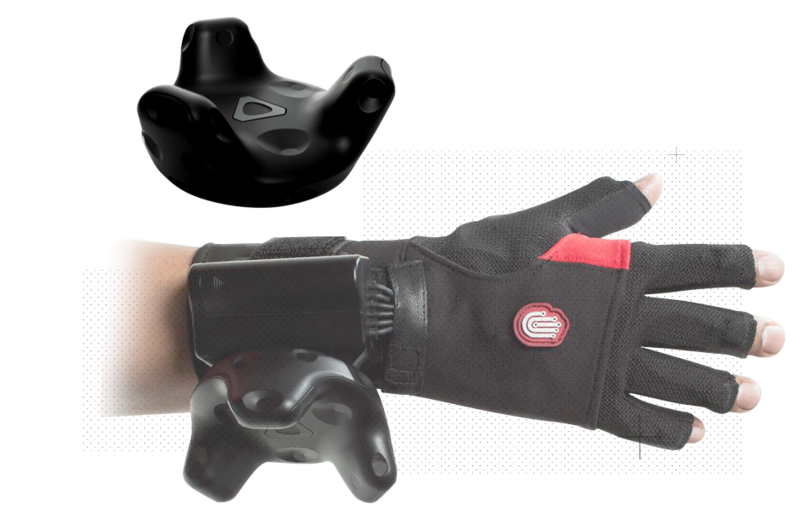 Created by the company that has revolutionized the motion capture industry, the Noitom Hi5 VR Glove fulfills the promise of fully immersing you inside the virtual world. Designed for continuous play, Hi5 is powered by just one replaceable AA battery and requires no recharging time. High accuracy and low <5 ms latency for seamless immersion into virtual reality. Antibacterial, breathable and environmentally-friendly elastic material stays clean and dry. Programmable vibration rumbler on each wrist provides haptic feedback for enhanced effects during VR experiences. Full hand and finger movement tracking for two-hand or single-hand modes supported. Plug-and-play with extremely quick and easy calibration. High performance 9-DOF IMU sensors with a gyroscope, accelerometer, and magnetometer for precise hand orientation. The Noitom Hi5 VR Glove is custom-designed for HTC VIVE®. Vive’s global positioning and rotation tracking delivers seamless integration with high accuracy and low-latency for integrating full-five-finger hand action within a virtual space. The gloves have been great. Took less than a day to integrate them into our application. The SDK is really simple to use and setup in Unity so, congrats to the dev team! I was amazed by how easily I could control a ball’s movement or the speed at which I hit a row of dominoes. I was able to use my hands to pick things up, throw them about, and even draw with my fingers. Going back to the Vive wands after this is going to feel like a bit of a step back. After trying the gloves...I came away feeling like I’d finally witnessed the right combination of finger tracking and motion input that could work in the consumer market. Please make sure to include a valid email.